WBEZ’s Podcast Passport series is proud to host LeVar Burton Reads LIVE! on March 23rd, 2018 at the Fourth Presbyterian Church. Hosted by the legendary actor, director, and children literacy advocate, LeVar Burton self-selects a compelling short story and reads it to audiences. This live show will feature a story from Chicago-based award-winning science fiction author, Nnedi Okorafor accompanied by live Afro-Cuban music from acclaimed Chicago musican Kahil El’Zabar. We all know LeVar Burton from his roles in Roots, Star Trek: The Next Generation, but perhaps most iconically as the host and executive producer for PBS’s Reading Rainbow. For 23 years, LeVar graced public television with his signature voice, kind personality, and his passion for connecting with and teaching young readers to also become passionate about reading. Now, LeVar Burton continues to read to a new type of audience: adults! LeVar himself has said how “it really does prove what we’ve all known our entire lives—that we all love to be read to.” (The New Yorker). 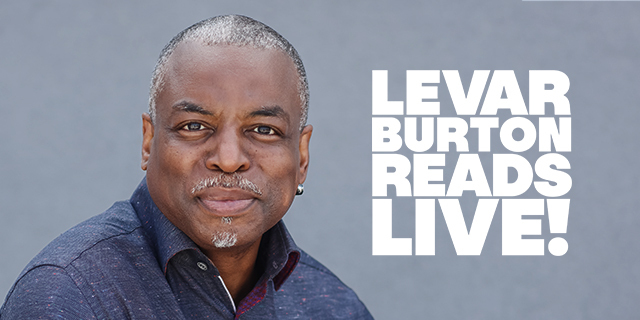 Join us with LeVar Burton Reads LIVE! at the stunning Fourth Presbyterian Church on a night full of storytelling, curiosity, and connecting to the inner-kid inside of us. LeVar Burton is an award winning actor, director, producer, author, and lifelong children’s literacy advocate. Nnedi Okorafor is an international award-winning novelist of African-based science fiction, fantasy and magical realism for both children and adults. Her novel Who Fears Death is in development with HBO for a series EP'd by George R. R. Martin, she recently wrote a miniseries for Black Panther and she recently released the third book in her acclaimed Binti trilogy. Nnedi is known for weaving African culture into creative evocative settings and memorable characters. Kahil El’Zabar was born and raised in Chicago- a homegrown South Sider! His acclaimed career as a musician has includes scores for three feature films - "Love Jones" (New Line), "Mo' Money" (Columbia Pictures) and "How U Like Me Now" (Universal Pictures) and musical arrangements for the stage performances of The Lion King. His efforts as a musician, educator, and community leader led to his being named "Chicagoan of the year" in 2004 by the Chicago Tribune. Kahil specializes in Bebop, Afro-Cuban jazz and Free jazz. WBEZ’s Podcast Passport brings podcasts from across the country to Chicago audiences who love seeing their favorite shows outside of their headphones! This series also provides an opportunity for WBEZ fans to engage with their favorite podcast hosts, as well as introduce new people to the exciting work WBEZ is doing in their communities. For more information, visit wbez.org/events. Fourth Presbyterian Church 126 E Chestnut St.